Funny 60th birthday jokes and one liners to help bring some laughter to this momentous (and perhaps *slightly* depressing) occasion! Turning 60 is a milestone worth celebrating, and a good excuse for a laugh too. Whether you want to gently tease, lighten the mood, or soften the blow of turning sixty, you'll find something funny here. Scroll down the page to read all our funny 60th birthday jokes and one liners, or click on these links to see a particular subset. A lot of these 60th birthday one liners are short enough for a card message or to include in a 60th birthday speech. 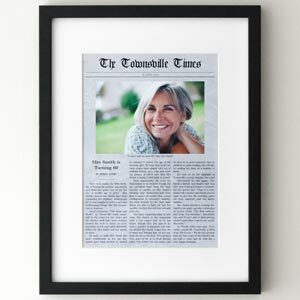 Other ways to use these jokes is to include as part of the birthday invitation wording, or print and frame one of the one-liners and use as a part of the party decor. You could also display a joke next to a photo of the person as a centerpiece near the birthday cake or as you enter the venue of the party. Or just text them a joke on their birthday as a funny way to say congratulations. Don't let aging get you down. It's too hard to get up again. You are so old, you walked into an antique shop and they sold you. You know you're getting old when you can't walk past a bathroom without thinking, "I may as well pee while I'm here." You know you're old when you turn down the lights to be economical instead of romantic. You know you're getting older when an "all-nighter" means not getting up to pee. Old age... when "happy hour" is a nap! Don't be upset about your birthday. Just think, you're one year closer to getting the senior citizen discount! Getting older has some benefits... Call it a "senior moment" and you can get away with pretty much anything! With age comes skills, it's called "multi-tasking". Now you can laugh, cough, sneeze, fart, and pee all at the same time! The best part of being sixty, is that you did all your stupid stuff before the internet. Don't stress about your eyesight failing as you get older. It's nature's way of protecting you from shock as you walk past the mirror. Forget age. If you can still manage to blow out your birthday candles, everything is dandy. Birthdays are good for you. The more you have, the longer you live! Congratulations, you've finally reached the wonder years... wonder where your car is parked? Wonder where you left your phone? Wonder where your glasses are? Wonder what day it is? The good thing about having a bad memory is that jokes can be funny more than once. We'll be friends 'til we're old and senile... and then we'll be new friends! I swear, if my memory was any worse, I could plan my own surprise party! I've reached an age where my train of thought often leaves the station without me. You know you're 60 when you're in an elevator when your favourite song comes on. You know you're 60 when getting lucky means a short wait in the doctor's office. You know you're 60 when your back goes out more often than you do. You know you're 60 when your back is hairier than your head. You know you're 60 when you have a party and the neighbours don't even realise. You know you're 60 when a kid you once babysat is now your lawyer. You know you're 60 when someone offers you a seat on the bus. And you don't refuse. You know you're getting old when the little old grey-haired lady you helped across the street is your wife. Don't worry, they are not grey hairs, they are wisdom highlights. You just happen to be extremely wise. Those aren't grey hair you see. They're strands of birthday glitter growing out of your head. A little grey hair is a small price to pay for so much wisdom. If grey hair is a sign of wisdom, then you're a genius! This one doesn't count as a grey-hair joke, but somehow it feels like it should fit in this section. I don't want to brag or make anybody jealous or anything... but I can still fit into the earrings I wore in high school. 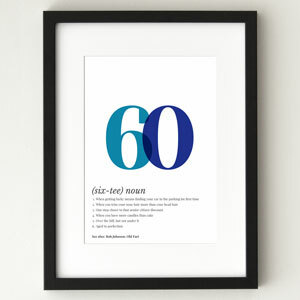 And if you're looking for a really unique and memorable way to wish someone a happy 60th birthday, then do check out our 60th birthday message posters . Easy to edit and print out at home, your gift will be the talk of the party! 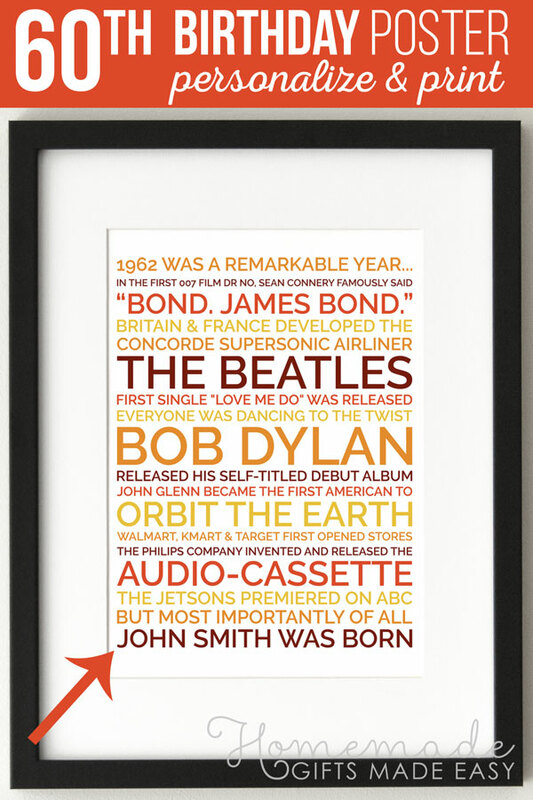 We've researched all the interesting and funny facts from the year they were born, and our poster maker formats it all beautifully for you. 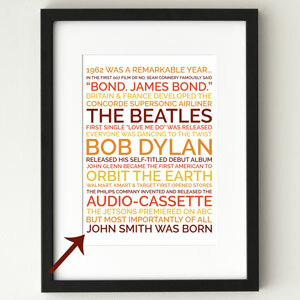 You can personalize the poster with their name, choose your color palette, and add anything else you want about them.